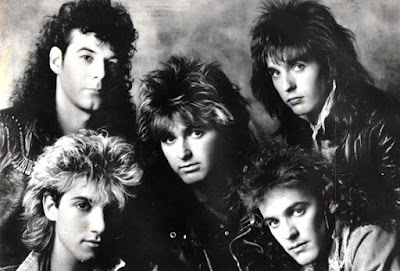 - The deepest roots of Honeymoon Suite took seed in 1981 when Johnny Dee (real name Jonathon Richard Degiuli) left Lennex and formed a new band, naming it in honour of his Niagara Falls home. Making Toronto their home, the band went through several early lineups, but began to solidify early the next year when he was introduced to Toronto native Derry Grehan by eventual manager Stephan Prendergrast. The two guitarists hit it off and lured drummer Dave Betts from Steve Blimkie And The Reason, who Grehan had also just left. And with an assortment of different keyboard and bass players over the next few months, began building a steady fanbase in the Toronto area. On the back of "New Girl Now" they won a local radio station contest and were soon signed to WEA later that year, and began packing houses while doing the Ontario circuit. They went into Toronto's Phase One Studios in the fall of '83 and during that time added Ray Coburn on keyboards and although John Finnerty and Brian Brackstone (the producer for Lennex's only indie 45) served as bassplayer on the album, Gary Lalonde, ex of Rose & Toronto, was hired before the release in June of '84. Their self-titled debut shot up the charts, eventually going platinum, with Dee's instantly recognizeable voice leading the way. The band's lendability to video and on the back of the mega hits "New Girl Now", featured on TV'S 'Miami Vice' and "Burning In Love", also made them staples of MuchMusic and MTV. Produced by Tom Tremeuth, who was behind the radio contest submission, it became one of Canada's most successful debuts of all time. "Stay In The Light" and "Wave Babies" carried on the debut's success, making it four straight gold singles and earning them a nomination for most promising group at that year's Juno Awards in the process. For the better part of 2 years they toured non-stop all across the continent, backing up such artists as April Wine, Laura Branigan, Jethro Tull, Billy Idol, The Kinks and Bryan Adams. The time on the road was spent writing the basics to the next album, recorded in Long Island, NY and Little Rock Studios in Vancouver. THE BIG PRIZE was released Valentine's Day '85, a ploy attempted but not pulled off the year before with their debut. With famed duo Bruce Fairbairn and Bob Rock of Payolas behind it, it turned platinum practically over night, riding the singles "Bad Attitude", the second track to make its way onto 'Miami Vice', "Feel It Again", and "All Along You Knew", which featured Jethro Tull's Ian Anderson on flute. "I think it's one of our best records," Grehan stated. "I think the songs are very strong and the production is huge. it doesn't get any better than having Bruce Fairburn and Bob Rock working on the same record." The band spent the next year on the road with Heart, .38 Special, ZZ Top, Journey, Starship, and Saga. After a much deserved break from the road, the band went to LA for the next project, RACING AFTER MIDNIGHT in 1987. With new keyboardist Rob Preuss (Spoons), they flew to LA and recruited Templeman to produce it, whose most noteable work included The Doobie Brothers and Van Halen, among others. But while there, Dee was involved in a car accident, resulting in surgery on his leg and causing delays in production. This prompted Templeman to call on Doobie Brother and friend Mike MacDonald to help out with production, writing and background vocals. "Love Changes Everything" showed a heavier side to their hard-pop sound, with Grehan's guitarwork shining through. It was soon followed up by "It's Over Now" and then "Looking Out For Number One". Making it their third straight platinum record. Dee's injuries now healed, they toured Europe with Triumph and Status Quo and were met by rave reviews, releasing "The Other Side Of Midnight" as a UK only single, and backed with the previously unreleased "Fast Company". Though also headlining a pair of cross-Canada tours, their label was growing disenchanted with their failure to live up to expectations in the US market. Coburn returned to man the keys just prior to WEA releasing THE SINGLES in '89. The greatest hits package also contained a pair of new tracks which head office hoped would make a dent in the US market. Again Templeman was used as producer for "Still Lovin' You" and "Long Way". Following Betts leaving the band to pursue outside interests, which now include working for SOCAN, and Lalonde following him out the door soon after, the band took their longest time yet preparing for the next release. They returned to the friendly confines of Toronto's Phase One Studios and MONSTERS UNDER THE BED hit the shelves in '91, marking the first time working with producer Paul Northfield. The new lineup featured Steve Webster (Billy Idol's band) on bass and veteran drummer Jorn Anderson, and quickly got their feet wet as a unit in preperation for another run at world conquest. The singles "Say You Don't Know Me" and "The Road" marked the band's return to mainplay on the airwaves, and the writing behind "Bring On The Night", "Little Sister" and "Miracle" was considered among the band's best. Another North American tour ensued with another push to crack the American market. But by this time the band's putting up with management's expectations reached it's end. Still, the band finished out the tour also despite having to bring in new memers again to fill out the roster after Betts and Lalonde parted ways with the group. Parts of these shows were combined with some from the subsequent UK run - winding up as 13 LIVE. Released on the independant Interplanetary Records, it was met with somewhat mediocre fanfare, despite being one of '93's sleeper hits in a year that begged for something special. The band's live shows had reverted to a sound closer to their raw roots, and the live versions of "Bad Attitude," "New Girl Now," and "Say You Don't Know Me" made it one of the better live records in rock's recent history. Differences with management however again left the band without a deal by year-end. They continued to play the circuits to keep their name prominenet, but by the spring of '94, only the core of the group remained again. While Dee was recording from left; gary lalonde, johnny dee, derry grehan, ray coburn, dave bettsSONGS IN DEE under his real name, Coburn left for the second time to work with Alannah Myles and then Crash Test Dummies, replaced with Peter Nunn, who'd previously pounded the keys with The Jitters, and toured with a venerable who's who, including Gowan, Andy Kim, The Kings, Alannah Myles, Ron Sexsmith, Matthew Good, Platinum Blonde, Images In Vogue, Brighton Rock, Mike Reno of Loverboy, Carole Pope of Rough Trade, The Waltons, Greg Godovitz (Fludd, Goddo), and Lorraine Segato (Parachute Club), among others. Grehan, like Dee, took some time off to pursue outside projects, only getting back together sporadically for the next few years with a various supporting cast. But the absence of good quality on the scene, and the especially strong resurgance for the Canadian classics led the band to get back together full time by decade's end, and to Grehan and Dee writing some of their strongest material in years. Grehan commented the band's sound is simply a culmination of everyone's musical interests that happens to gel well. "My influences had always been melodic rock. everything from Deep Purple, Alice Cooper, Kansas, Santana and on and on. Later on I got into Stevie Ray, Van Halen, Peter Gabriel and others," he said. "The sound of HMS is a combination of my style of writing, coupled with Johnnie's voice and Ray's big keyboard sound. Nothing was ever planned or contrived about our sound, its just what happened when you mixed the ingredients together." He continued that for the most part, the way he and Dee have written songs hasn't changed since they first started collaberating, one of the keys to the band's longevity. "For the most part, the bulk of the songs are written by me. I'm pretty meticulous about the process and I like to bring in a song as close to being finished as possible. With every song I have a concept of how I hear it and how I want it to sound when its recorded. I've also collaborated with Johnnie on a lot of things as well." They went back to Phase One in the spring of 2001 and laid the groundwork for their next project, though still shopping around for a label. The new lineup was finalized with Nunn returning on drums, bassist Rob Laidlaw and Bret Carrigan on keyboards. After bringing the roofs down during their cross-country tour later that year they signed a deal with Bullseye Records, Canada's biggest indie label. European distribution was handled by Frontiers Records out of Italy. The much anticipated return of the band happened in March of 2002, when LEMON TONGUE was released to rave critical reviews, despite it not exactly being the band's personal favourite. Still, bristling with energy and with a maturity in the writing, the lead single "The Way I Do", the title track, "Don't Make Me Want You" and "Into Me Into You" show a band that's stood the test of time and ready to reclaim the airwaves. "LEMON TONGUE was our first independent, low budget lp, and I hope it's our last under those conditions," Grehan joked. "We did it all ourselves on a shoestring clockwise; johnny dee, derry grehan, gary lalonde, dave betts, ray coburnbudget and I tried to make it sound as good as possible with what I had to work with. I don't care what anybody says, you can not make a world class record without a proper budget and top people working on it." '05 was a busy year for the band album-wise. DREAMLAND was released in Europe only, more or less a remix of LEMON TONGUE with a few surprises, featuring the lead-off "What I Know," a remix of "Still Lovin' You," previously unavailable except as a b-side, "The Way I Do," "Radiant" and the title track. 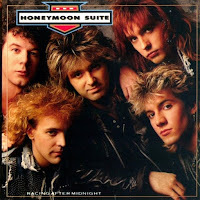 hortly thereafter they released the appropriately titled HONEYMOON SUITE LIVE which featured 12 of the songs that made them one of the biggest on the scene for so long, also a European only release, as they were all on a European label for that market. Warner took advantage of the back catalogue and then released a 'best of' package called THE ESSENTIALS before year's end. 2007 marked a full fledged reunion of the five original members to rave reviews, as well as a complete greatest hits package called FEEL IT AGAIN - AN ANTHOLOGY, a double disc set which also included eight previously unreleased tracks. "We didn't want to just do another greatest hits collection. We wanted to give something back to the fans that had stuck with us, as well as give something new to new fans. That was really important to us," Grehan said. With Coburn again leaving to do his own thing, Nunn returned, and in the fall of 2008, CLIFTON HILL was released, heralded as one of the best 'lesser known' records in years. Backed by the strength of tracks like the lead off "She Ain't Alright," the snappy guitars in "Riffola," "Restless" and the tender "Why Should I? ", it marked a record full of tight hooks, smooth melodies and the experience of one of Canada's top musical talents. - Honeymoon Suite is a Canadian hard rock band formed in 1981 in Niagara Falls. The band's name was a nod to the fact that Niagara Falls is the unofficial honeymoon capital of the world. The band was originally formed in 1981 by Johnnie Dee (vocals, guitar), Brad Bent (keyboards, vocals) and Mike Lengyell (drums, formerly with The Diodes). By 1983, the line-up changed, with Dee (the only original remaining member) now on rhythm guitar and lead vocals, along with new recruits Derry Grehan on lead guitar and Dave Betts on drums. Grehan became the band's primary songwriter, and penned "New Girl Now," which won them an unsigned band contest put on by Toronto radio station Q107. Various keyboard players and bassists came and left during this time, but on the strength of "New Girl Now," WEA Canada signed the band to the label. Ray Coburn was added as a permanent new member on keyboards as the sessions got underway for the group's debut LP, but the band still had no bass player so bassist Brian Brackstone was recruited as a session player. Brackstone played on the entire album; bassist Gary Lalonde (formerly with Rose and Toronto) was added to the line-up after the album was completed and appeared in the album's group photos and played with the band live. The band's self-titled debut album, produced by Tom Treumuth, was released in June, 1984. The album featured four charting hits in Canada: a completely re-recorded version of "New Girl Now," "Burning In Love," "Wave Babies," and "Stay In the Light." All were written by Grehan. "New Girl Now" was also Honeymoon Suite's first single to reach the top-50 in the United States. Their follow-up album, The Big Prize, produced by Bruce Fairbairn, was equally successful in Canada with four more hits: "Bad Attitude," "Feel It Again," "What Does It Take," and "All Along You Knew." Grehan still wrote the lion's share of the band's material, but Dee and Coburn also contributed songs to this album; "Feel It Again", a Coburn composition, reached the Top 40 in the US, while Grehan's "What Does It Take" reached no. 52, buoyed by its inclusion on the soundtrack for the John Cusack film One Crazy Summer. In 1989, "Bad Attitude" was featured in the series finale of Miami Vice, played during a Ferrari driving segment that mirrored one from the series' pilot episode. In 1986, keyboardist Ray Coburn left the band, replaced by Rob Preuss of Burlington, Ontario-based Spoons. Also during 1986, the band produced the track "Those Were the Days" for the Charlie Sheen film The Wraith. In the spring of 1987, the band performed the title track for the Mel Gibson film Lethal Weapon, which was composed by Michael Kamen. In the winter of 1987, the band started work on their third album in L.A. Unfortunately, Johnnie Dee was hit by a car at LAX airport, breaking his leg in several places and required surgery to insert a ten-inch pin to help the leg heal properly. While Dee was recovering in the hospital, one-time Doobie Brothers member Michael McDonald was brought in to help out with the recording sessions; he wrote lyrics and sang back up on "Long Way Back," a forthcoming track for their next album. In 1988, their third album was finally released: Racing After Midnight, produced by Ted Templeman (of Van Halen fame) and Jeff Hendrickson. That album made the top 10 in Canada, but was not as successful in the U.S. Singles included "Love Changes Everything," "Looking Out for Number One," "Cold Look" (Europe only), and "It's Over Now." By now, while Grehan was still the primary songwriter, Dee and Preuss frequently co-wrote with Grehan. In 1989, the band released their first greatest hits compilation, The Singles, which included two new charting singles in Canada: "Still Loving You" and "Long Way," both written by Grehan. Preuss left and Coburn rejoined the band in time to embark on "The Singles" tour, which would turn out to be the last tour featuring the band's classic line-up until 2007. By 1991, Lalonde and Betts left the band, and were replaced by Steve Webster (from Billy Idol's band) on bass, and Jorn Anderson (from Fludd and Alannah Myles) on drums. The band returned to the studio to craft Monsters Under The Bed with Paul Northfield producing and the team of Grehan/Coburn/Dee was responsible for the songwriting. Singles "Say You Don't Know Me" and "The Road" were moderately successful in Canada, but once again failed to make a dent in the US. Ray Coburn left the band again after this album. He was replaced on keyboards by Peter Nunn. The band continued to tour in the '90s, although many line-up changes continued to occur, with only Dee and Grehan remaining as the consistent members. Sass Jordan bassist Stan Miczek joined in 1998 for the first of his 3 two-year stints with the band. In 2002, they released their first new studio album in 11 years, Lemon Tongue. Playing on the album were Grehan and Dee, who were by now the group's only official members, and who also wrote all the songs as a team. Also appearing on Lemon Tongue were Peter Nunn and Gary Brent on keyboards; Rob Laidlaw on bass; and Randy Cooke on drums. The album was released on an independent label and leaned towards a more artistic and adventurous direction than their previous rock releases. The European release of this album was titled Dreamland and featured many track changes, dropping five songs and adding four others, including a remake of their 1989 Canadian hit "Still Loving You." The credited band on the Dreamland album (and presumably the band that recorded the new tracks) consisted of Dee, Grehan, Laidlaw, Nunn and new drummer Bret Carrigan. In 2004, Dee released a solo album (Songs in Dee) featuring backing by the other members of Honeymoon Suite, along with guest musicians such as Kim Mitchell and Rik Emmett. In 2006, the band released another greatest hits collection entitled Feel It Again: An Anthology, a 2-CD set featuring most of the band's singles, selected album tracks, and rare and unreleased material. In June 2007, the band officially announced the return of a reunited classic line-up of Johnnie Dee, Derry Grehan, Ray Coburn, Gary Lalonde, and Dave Betts. The band toured extensively throughout Canada in 2007 and 2008 and then entered the studio to record a new album. The high point of the reunion was the new CD Clifton Hill, produced by Tom Treumuth (who produced the self-titled Honeymoon Suite debut album in 1984), and named after the famous landmark in the centre of the tourist activity in Niagara Falls. The album was released in Canada in late September 2008 on Koch Records and subsequently by Italian melodic rock label Frontiers Records on October 10, 2008. The new album is described by guitarist Derry Grehan as "somewhat of a return musically to the sound that we had in the '80s." In 2009, the band continued to tour Canada and select Northeastern United States cities. However, on September 1, 2009, it was announced that the band had again parted ways with original keyboardist Ray Coburn. Peter Nunn returned to the band's line-up to replace him for the second time. The band made a successful appearance at Firefest 6 Nottingham, England to an enthusiastic audience in October, 2009. - Johnnie Dee and Derry Grehan, the principal and founding members of Honeymoon Suite, met when introduced by manager Stephen Prendergast in 1982. Deciding to work together, they formed Honeymoon Suite with Grehan’s former Steve Blimkie And The Reason’ band-mate Dave Betts on drums, plus an anonymous keyboard player and bassist. In 1983 they decided to enter the Homegrown Contest put on yearly by Toronto’s Q107-FM radio station so Prendergast approached his friend and producer Tom Treumuth to produce a song for them. Based on the buying public’s response, “New Girl Now” won the contest and Bob Roper at WEA Canada was so impressed with the song and response that he signed the band right away. Personnel conflicts eventually arose and the keyboardist was replaced with Toronto bred Ray Coburn. Although a session player named Brian Brackstone played bass on the album, the band soon found themselves a permanent bassist named Gary Lalonde. Originally scheduled for release on Valentine’s Day, the milestone first album was released in June of 1984. Throughout 1983 and 1984 Honeymoon Suite toured Canada and the US, consistently headlining club gigs and opening for such acts as Billy Idol, April Wine, Laura Branigan, Jethro Tull, The Kinks, and Bryan Adams. In 1984 the band was nominated for the ‘Most Promising Group’ Juno Award but did not win. Propelled by the success of more singles from the album, 1985 saw the band begin to headline gigs throughout Ontario and the rest of Canada. A highlight was the presentation of an award at the 1985 Junos. By this time the first album had achieved platinum sales status. Almost 22 years later the album has now sold over 400,000 units in Canada alone. Honeymoon Suite’s second album was released on Valentine’s Day 1986. ‘The Big Prize’ featured a rare appearance by Jethro Tull’s Ian Anderson. It went platinum in Canada almost immediately and started selling steadily in the US. Tours in the States that year included opening stints for Heart, .38 Special, ZZ Top, Journey, Starship, and Saga. The band also headlined a sold-out show at the Kingswood Music Theatre just north of Toronto. Ray Coburn left and was replaced by Toronto whiz-kid keyboardist Rob Preuss (formerly of the Spoons). 1986 also saw the band win a gold award for ‘Best Live Act’ at the World Popular Song Festival in Tokyo, the ‘Group Of The Year’ Juno and headline more dates in both Canada and some northern States. For album number three, the band went to Los Angeles in the winter of 1987 to record with Ted Templeman (Little Feat, The Doobie Brothers, Van Halen), and while there Dee was hit by a car at L.A.X. airport breaking his leg in several places and requiring surgery for a ten inch pin to help the leg heal properly. While recovering in hospital, Doobie Brother Michael McDonald was brought in to help out with the recording sessions; he wrote lyrics and sang back up on one song. The results of all the hard work was ‘Racing After Midnight’, a slightly harder-edged more guitar oriented album that spawned a European tour with Status Quo and a headlining tour of Canada. Problems then surfaced with long-time management company Head Office and after the group left the fold, keyboardist Ray Coburn returned to the band in time for WEA to release a ‘best-of’ compilation in 1989. Betts and Lalonde then took their leave and Coburn, Dee and Grehan began writing together again. The trio returned to the studio in 1990 to craft ‘Monsters Under The Bed’ with Paul Northfield producing. The album featured Steve Webster ( from Billy Idol’s band) on bass and Jorn Anderson on drums. Singles like “Say You Don’t Know Me” and “The Road” did well in Canada. Some US success did come their way as songs got placed on TV’s ‘Miami Vice’ and two movie soundtracks, ‘Lethal Weapon II’ and ‘One Crazy Summer’. In other recent activity a new Best of album has been released on Warner in Canada as part of their Essentials series. A new Best of Honeymoon Suite DVD featuring all their videos and live concert footage is also scheduled to be released by Warner this fall. - Although the Toronto-based quintet Honeymoon Suite never managed to break through in a major way with audiences south of the border, they did find their way onto the charts a handful of times in the U.S. They also were a popular live act and opened for some of the period's biggest draws, including Heart, Journey, and Billy Idol. The band's formation can be traced to the introduction of lead vocalist Johnny Dee and guitarist Derry Grehan by the group's future manager in 1982. Within a year, Honeymoon Suite had been formed and earned the attention of WEA in Canada on the strength of the song "New Girl Now," which had won an unsigned band contest sponsored by a Toronto radio station. Their self-titled debut appeared in 1984 and established them as rising stars in their homeland, charting four Top Ten singles. One of those hits, "New Girl Now," managed to crack the U.S. charts, reaching the mid-50s, but garnered considerable airplay on rock radio.